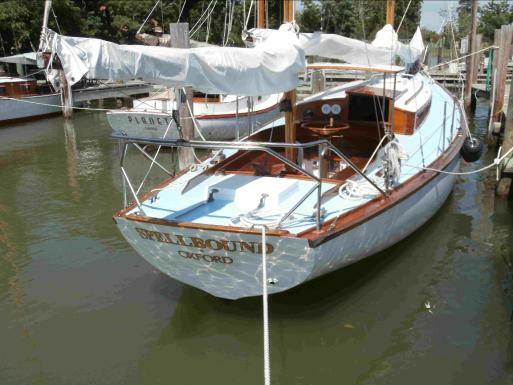 This year’s Fleet 10 Summer Cruise was organized by Tom Beaumont. 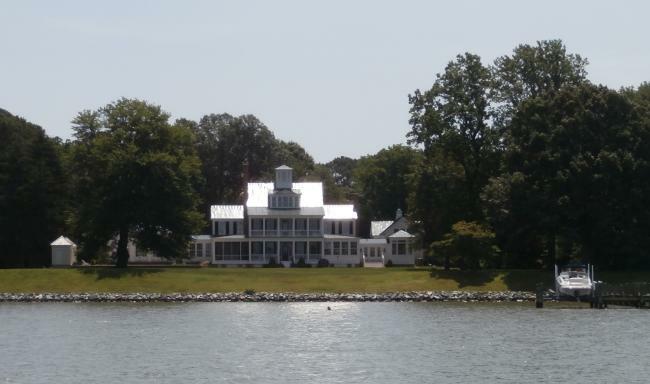 It was a “Cities of the Choptank River” Cruise, because we visited St. Michaels, Oxford, Easton, and Cambridge, Maryland. When I write these articles, I usually write where all of the boats of our fleet sailed from on the Chesapeake Bay to get to the cruise. But this year, we had many C-22s that were trailered to participate in the cruise. Mike Bracket, came from Michigan. Rick and Jim came from Indiana, as did Geoff and his family members, who took turns sailing with him on different days of the cruise. 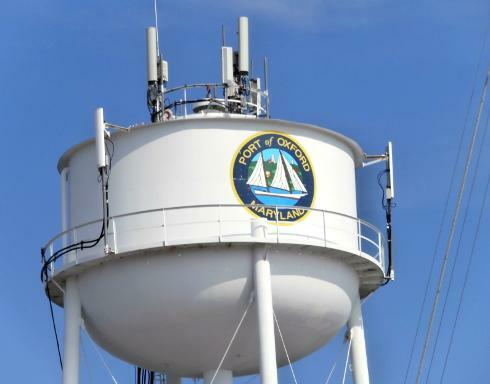 All of the above usually sail on a Great Lakes cruise, but there wasn’t one this summer. Floy and Chuck came from Lake Arthur, near Pittsburgh, PA. They are sailing friends of Patty and Ken, who had sailed on several Fleet 10 Summer Cruises with us, and Patty and Ken told them that they would enjoy sailing with us for a week. They immediately fit right in. 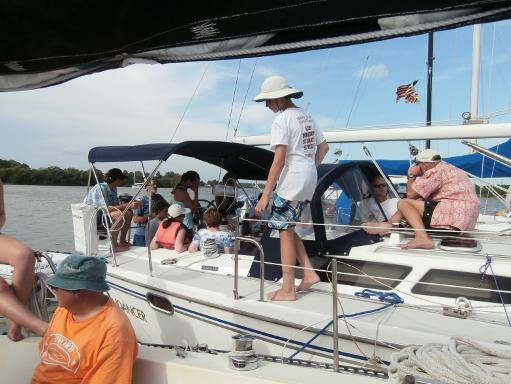 This is the first time we got to sail with George, who has been a member of our fleet for several years. These were his home cruising waters, since he keeps his boat in Cambridge. There were eight C-22s on this year’s cruise, and the other boats ranged up to Ken’s Catalina 320, Moondancer. For Alice, our son Dan, and me, the cruise started on Friday morning, June 27th. We had driven to our boats the night before after work, and packed them. 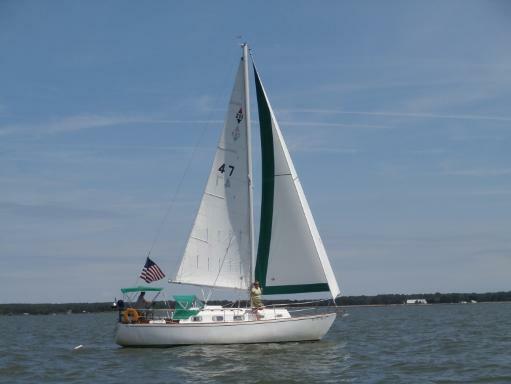 On Friday morning, we had a nice sail down the bay, reaching and running toward the center of the Chesapeake Bay Bridge on a cool breeze. 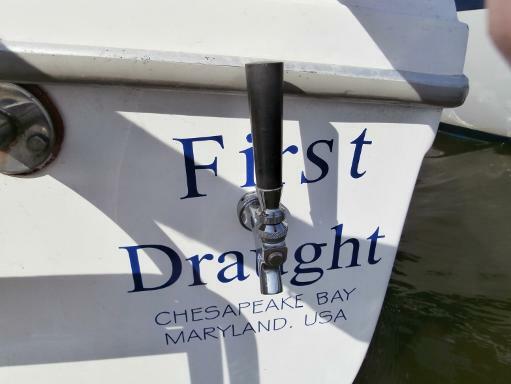 We tried to keep track of Dan on First Draught, but couldn’t determine which boat was his, among all the other boats that were sailing down the bay, north of Annapolis. We called him on the phone, and then on the VHF, and asked him how fast he was going. We were sailing between four and five knots, on WoodWind, and he said that he was only going two. He realized that something must be wrong, and started his motor, which didn’t help. But soon two crab trap floats came out from behind his boat and his speed then increased. Alice and I soon passed under the bridges, and watched Dan cross under them about 20 minutes later. We sailed 36 miles that day, but it was easy. We met Tom and Loretta on Energy in the Rhode River, and rafted to them, Dan rafted on the other side using a big new fender that he rescued during the day. Tom made steaks for us on Dan’s grill, and Alice brought a salad from our boat. We certainly got the best of that deal. On Saturday, we sailed to the marina, Herrington Harbor North. We usually stay at Herrington Harbor South, but Tom said that they couldn’t take the 18 boats that were sailing with us on this year’s cruise. 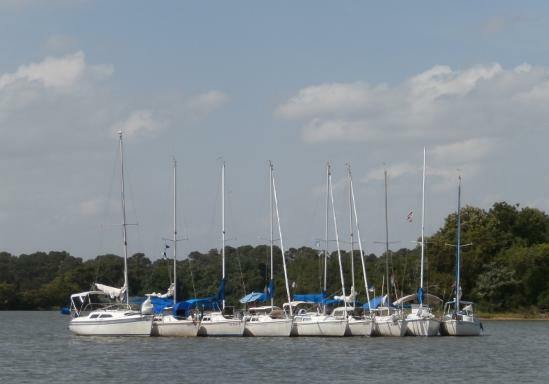 We had only visited Herrington Harbor North in the winter, and we always thought that it was more of a boat yard, not a resort marina, like Herrington Harbor South. But, we were wrong. Herrington Harbor North was a very nice marina with nice park-like grounds, nice pool and picnic areas. 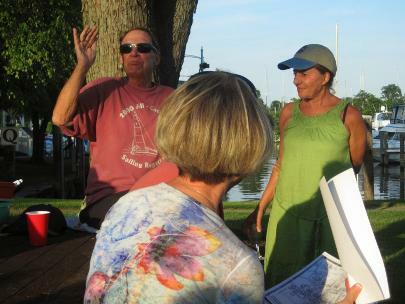 The Opening Picnic was held there, as was the first of many Skipper’s Meetings conducted by Tom and Loretta. It was great to see Dan and Grace at the picnic. Barb joined Ken for the night, and Pat joined Richard. 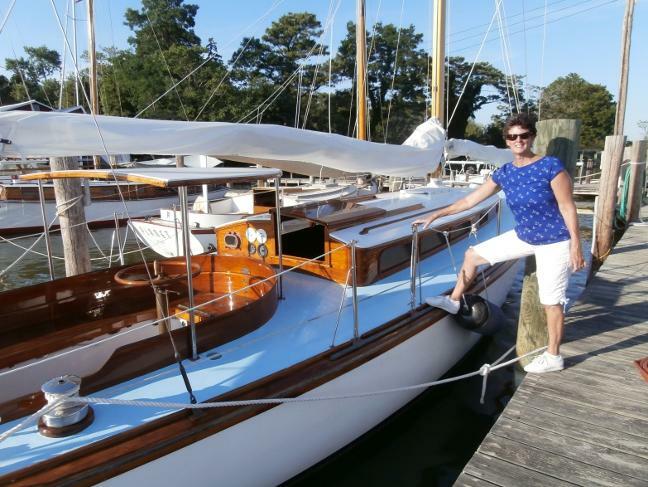 Pat said that she really likes Richard’s boat until he ruins it by putting up the sails! On Sunday, we sailed to St. Michaels. Some boats went around the southern end of Tilghman Island, and others went under the Knapps Narrows drawbridge. 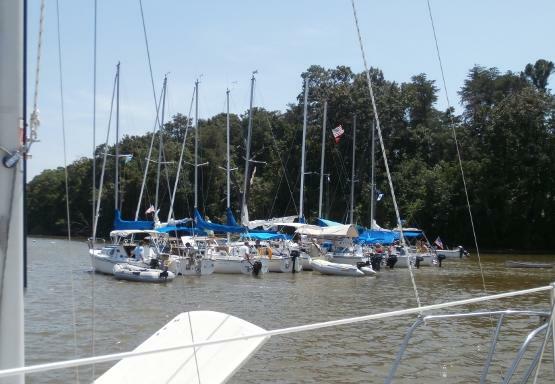 It was a great sail once we got into Broad Creek. Jim and Sean showed off their spinnaker handling skills by easily passing us in the creek with Reflection. 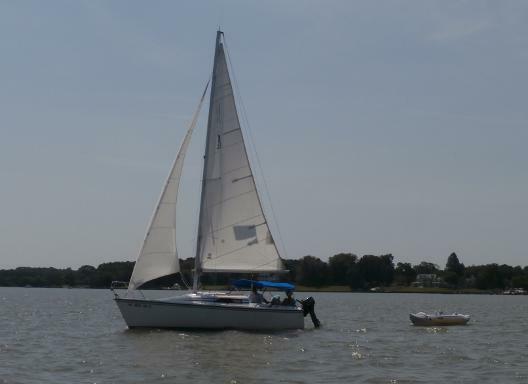 We ran aground with WoodWind, an Ericson 26, with a 4 foot draft. Chris pulled us off the bottom with his C-22, Paladin. We couldn’t believe that we ran aground near buoy number 4, because we had been following a sailboat much bigger than ours, and he made it right through. 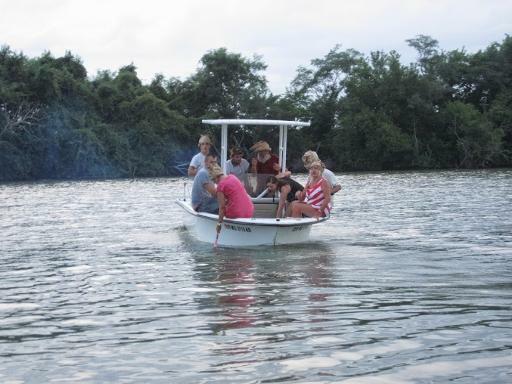 After we rafted our boats to the rafts in San Domingo Creek, (a bigger boat raft and a smaller boat raft), we took a dinghy to the town’s fisherman’s dock, and walked into town. We ate at Foxy’s Harbor Grille in St. Michaels, where the barmaid knew Phil well, (but we think that there were probably many establishments in St. Michaels where they knew Phil well). On Monday, we sailed to Oxford. We stayed at Brewer Marina which had a great pool and a nice deck. We walked around the town, ate some ice cream, and walked around Cutts & Case Boat Yard and Marina. 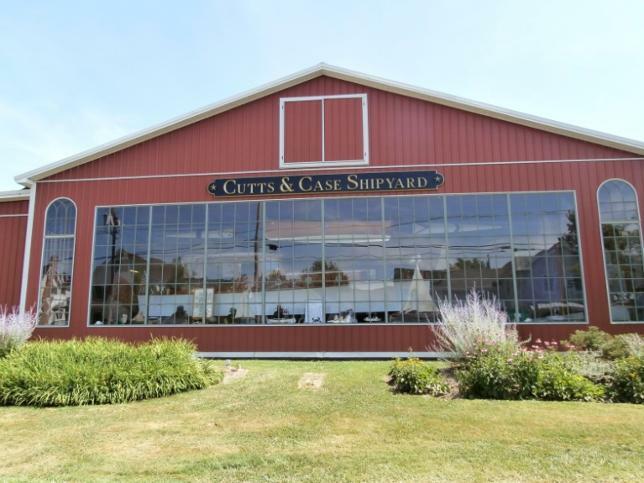 Cutts and Case is the boat yard where Dan’s C-22, First Draught, was kept, before it was given to him. We were invited to walk through one of their workshops, which was really more like a museum. We also walked onto some of their docks and found the boat, Spellbound, that appeared in the movie, Failure to Launch, with Mathew McConaughey and Sara Jessica Parker. The woodwork on the 47 foot boat is unbelievable. The boat was built by Edmund Cutts in 1970. We had dinner at Schooner’s Restaurant, that evening. I ate with Mike Bracket. 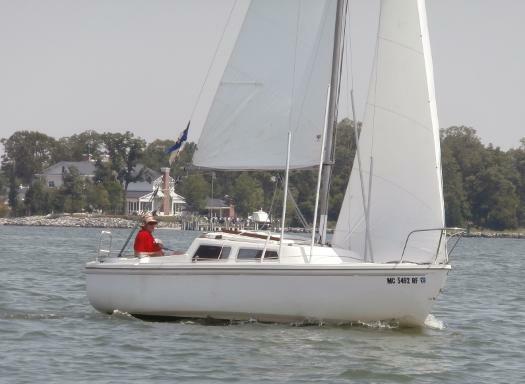 I had e-mailed him several years ago, and he always told me how lucky I was to be able to sail on the Chesapeake Bay, which was something that I had just taken for granted. It was nice to finally meet Mike in person, and hear about some of the work that he had very recently completed on his boat, to repair a problem that occurred with his keel cable clevis pin, (that he wrote about in the last issue of MainBrace). Heather and Carol gave everyone a jar of pickles, and monkey fists that they made. (They called them “monkey balls”). On Tuesday, we sailed to Easton, a town up the Tred Avon River. 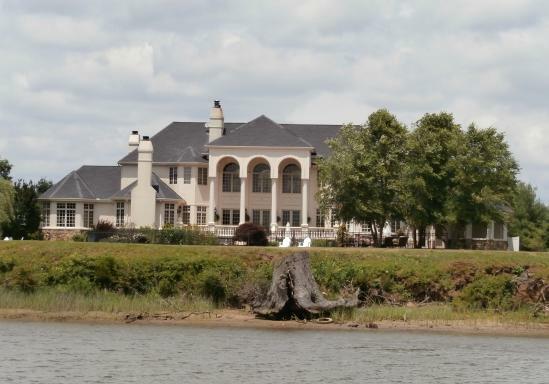 The houses along the river were unbelievable. We sailed up the river near Floy and Chuck, on an easy run. 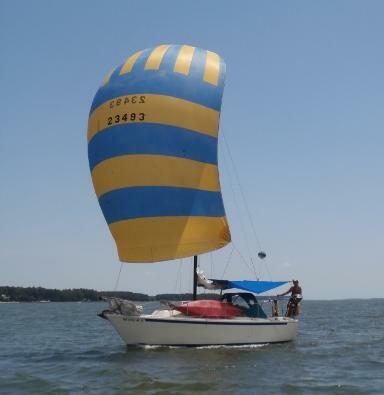 We were only going to use our jib, since we only had a few miles to go that day, but when they passed us, we decided we better put up our main too. Later, we went into town on Augie and Lori’s dinghy, but the raft was so close to the bulkhead that we could have taken Alice’s kayak in and pulled it back to our boat with a string. There was a “big boat” raft and several small boat rafts. A single small boat raft had been put together earlier in the day, but had to break apart because a barge was going to be moved through the area where they had rafted, later that night. There wasn’t enough room for an 18 boat raft either. Alice and I had lunch at Doc’s Sport’s Bar with Augie and Lori, where our son, Dan, joined us after riding there on his folding bike. He had something that he had to pick up for his boat in Easton, (more on this later). World Cup Soccer was on the 4 TVs at the restaurant, and the crowd was very enthusiastic watching the game and cheering. Everyone gathered on the bigger boat raft for dinner, snacks and drinks that evening. 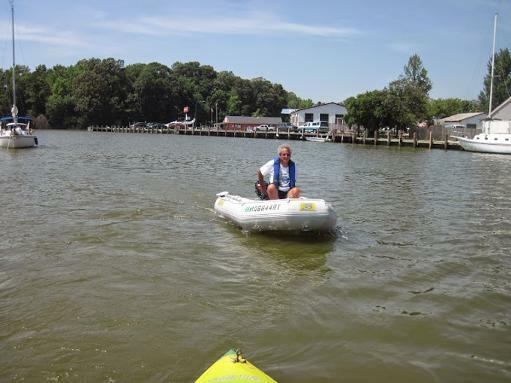 Bill ran a taxi service shuttling people between boats and the shore with his dinghy. On Wednesday, we sailed to Cambridge. It was into the wind most of the way, then a turn and a run to Cambridge. Mike sailed Gunsmoke past Augie and Lori on August Moon, and then sailed by us too, in the light air. Tom told me earlier that Mike really knew how to sail and race his C-22, and this made me tweak the sails on WoodWind to get a little more out of the upper part of the jib of the boat. 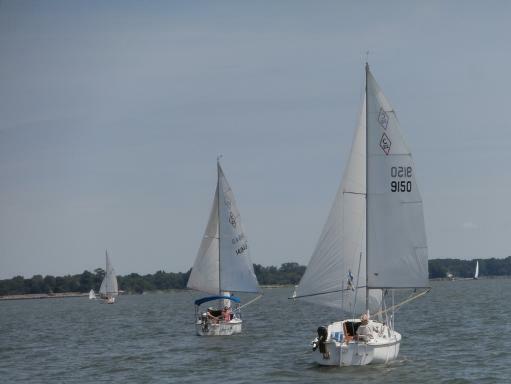 The VHF radio conversations with the Cambridge Municipal Yacht Basin were interesting, with all of our boats from our fleet arriving there at nearly the same time, and calling-in for their slip assignments. We walked around Cambridge, and my comments from my notebook were, Hot, Hot, Hot! We ate at a little pub called The High Spot. We used the fan to ram air down the front hatch that night. Cambridge is a nice town to walk around with many old houses. 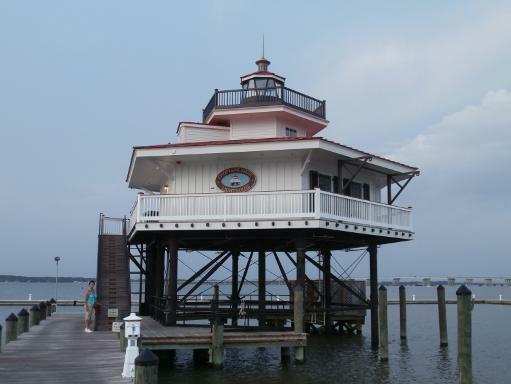 The marina had its own lighthouse. On Thursday morning, Dan and I installed a stick onto the tiller of Heather and Carol’s C-22, Yes II. The stick was made from a cannibalized telescoping snow brush, and one end went onto a little ball inserted into the tiller, and the other end had a pin that went into the winch. They used this stick to hold the tiller, and as a hiking stick. 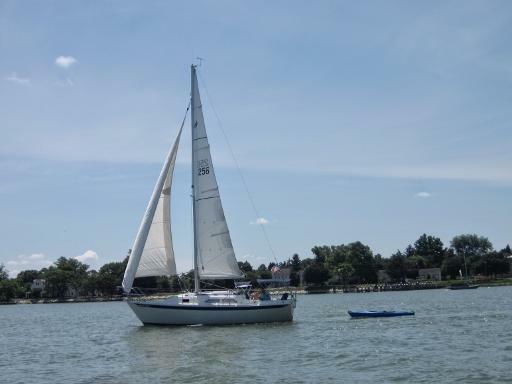 On Thursday, we had a short sail to La Trappe Creek. There was swimming and kayaking and running around in dinghies. Many gathered at the small beach. We ate dinner on Ken’s, MoonDancer, and on Tom and Loretta’s, Energy, with contributions of food from all the boats. The crews from the smaller boats came to the big boat raft by dinghy for dinner. Heather and Carol again brought out the paper bags for making hats. WoodWind was tied-up next to Eric and Barb’s, Bristol 27, Ragtime. Their daughter, Sara, had invited her friend, Kira, on the cruise this year. I remember Kira talking to her mother on her cell phone, assuring her that she was “perfectly safe”, as we were watching the lightning go all around our raft in the cove that evening. As we were relaxing on our boats after dinner, the sailors on the other raft talked some locals that were cruising around the cove in their motorboat, to sneak attack our raft. They were a sight in their paper hats, and attacked us with water balloons and squirt guns. After two trips around our raft, they returned to their raft. A counterattack was planned that involved kayaks, dinghies, and a secret weapon, Tom hanging on the front of one of the dinghies. The big boat raft broke up, after the storms went around us, and the anchor line wrapped around a keel. This often happens, because a big boat raft can’t rotate around the anchor as fast as the wind can shift, because of so much keel area. The little boat raft did fine though, and stayed together all night. On Friday, the weather radio predicted gale warnings, the remnants from Hurricane Albert. Several of the C-22s went into the creek behind the cove that we had anchored in the day before. Most of the bigger boats remained in the cove. Alice and I motored up La Trappe Creek because we didn’t think that there would be enough deep water in the little creek with the C-22s, and we didn’t want to get stuck again. We anchored near 2 mansions that blocked the wind. Phil visited us that afternoon on his C-250, Schatzi. He rafted to us while we helped him get his alternate anchor sorted out. He had been trying to use a Delta or plow anchor, but we helped him get his Danforth anchor ready, and this anchor worked fine for him that afternoon, as the wind subsided. Danforth anchors usually work well on the Chesapeake. 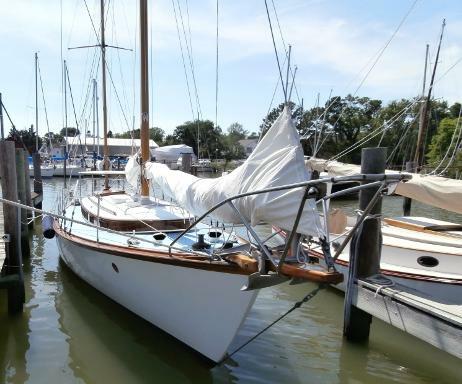 Alice and I had a very relaxing day at anchor, but the wind caused the fleet to miss a visit to the marina at Slaughter Creek on the Little Choptank. The boats that remained in the cove joined up for dinner, and the cruisers had a bonfire on the beach that evening. On Saturday, we motored through the cove, said our goodbyes to the fleet, and began the 50 nautical mile sail northward up the bay. 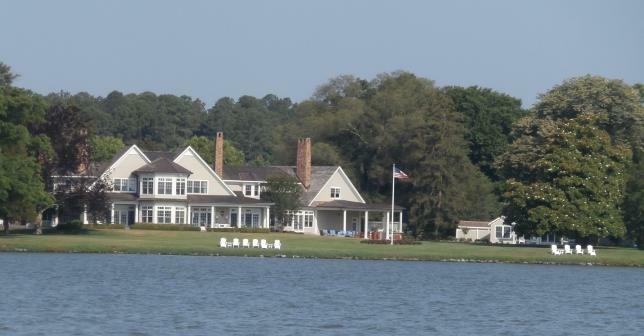 The wind soon died on us, and we motored for many hours toward our home marina on Middle River. Before we got there, Alice said that she wanted to have dinner at Mike’s on Rock Creek, off the Patapsco River. (This is just down river from Fort McHenry, of Star Spangled Banner fame). We anchored WoodWind, and took First Draught into one of the marina’s restaurant slips. 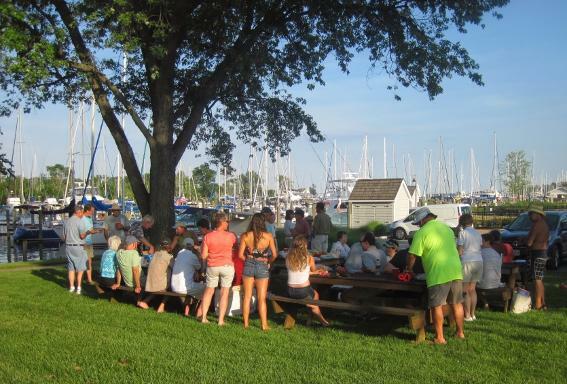 We had planned on motoring the rest of the way back to our marina after dinner, but were too tired and full, and spent the night rafted together between Mike’s Marina and the Baltimore Yacht Club. 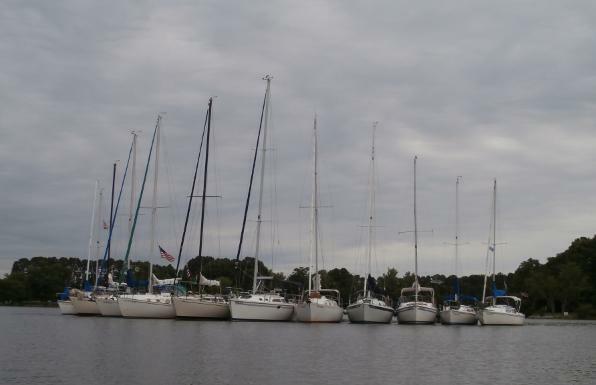 On Sunday morning, we got ice at the yacht club, and had a nice easy sail back to Middle River. We had covered 201 nautical miles since we left our marina, (but that includes all the miles that we sailed at night at anchor, since I kept the GPS’s anchor alarm on every night when we were at anchor). I almost forgot to write about Dan’s purchase for First Draught in Easton. He had to go to a beer distributor to get some mini-kegs of Heineken. 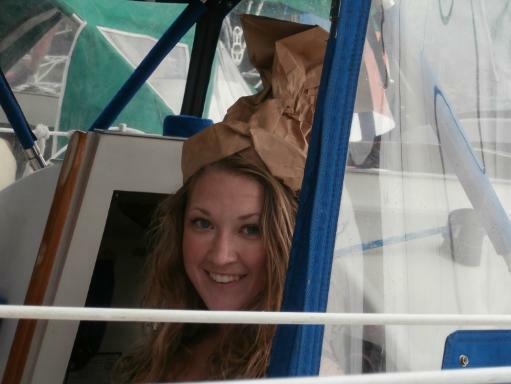 This photo shows the recent addition that he made to his boat that made it very popular on the raft-ups. We want to thank Tom and Loretta for all their work planning this year’s cruise, and all the food that they fed to us and the rest of the fleet. It was a fun and relaxing cruise with good weather, except for the day with the remnants of the hurricane, but even that day was relaxing.